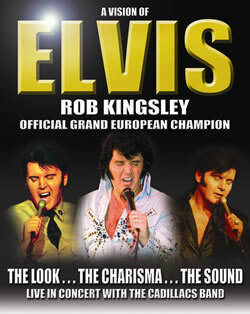 Recognised as the outright “Official European Champion” by winning Europe’s Largest Elvis competition, Rob Kingsley is officially endorsed by Elvis Presley Enterprises for his charity work and also by Mr Ed Bonja – Elvis Presley’s Official Photographer and Road Manager, who worked closely with Elvis on more than one thousand concerts from 1970-1977. Featuring his very own “The Cadillacs Band” with “The Sweet Sensations”, Rob brings you a full evening of all the classic hits, from the Early Years through to the sensational “Vegas” era – with the finale being the Concert Years. Rob has the distinction of being the first Elvis Tribute Artist to perform live at the new Wembley Stadium, with other performances including Hyde Park London, and many prestigious theatres and venues in the UK and Worldwide. Rob Kingsley has the total package – the look… the sound… the charisma, and together with his fantastic costumes this show leaves the audience in no doubt that they are witnessing a truly authentic Elvis show. “A Vision of Elvis” – is the Elvis show to see. Seen this show a couple times think rob is brilliant got tickets to go back to pavilion on 24th march hope its still on due to the fire. Really enjoyed the very professional show tonight. Elvis great and the girls and musicians. Much better than the last Elvis we saw in Worthing a few years ago. Keep up the good work. We will come again to Worthing, Can you possibly sing “Mama loved he Roses” for me next time!